Projector Technology. An article from Ivojo Multimedia. 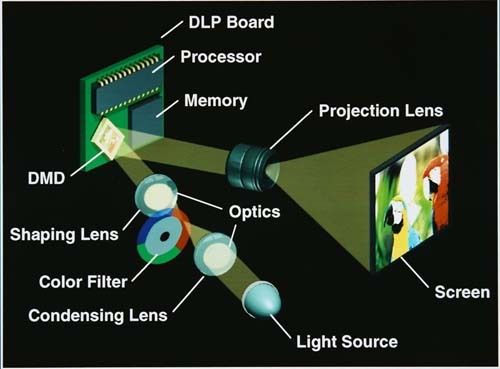 Digital projectors broadly fall into two different technologies, DLP from Texas instruments and LCD with its various derivatives (LCOS and D-ILA). DLP uses a DMD (Digital Micro-mirror Device) chip made up of thousands of micro mirrors, each of which corresponds with a pixel of the finished image. Each of these mirrors can be independently tilted to either reflect light towards the lens or away from the lens towards a light absorbing baffle. The easiest analogy is to think of each mirror being a light which is switched either on or off. The mirrors can tilt several thousand times per second so when an individual mirror is "on" more often than it is "off" we get more light reflected and when it's "off" more often than "on" we get less light reflected. This results in a lighter or darker shade of gray pixel. The light reflecting off the DMD is - at this stage - in shades of gray and the next stage is to turn this image from grayscale to full colour. 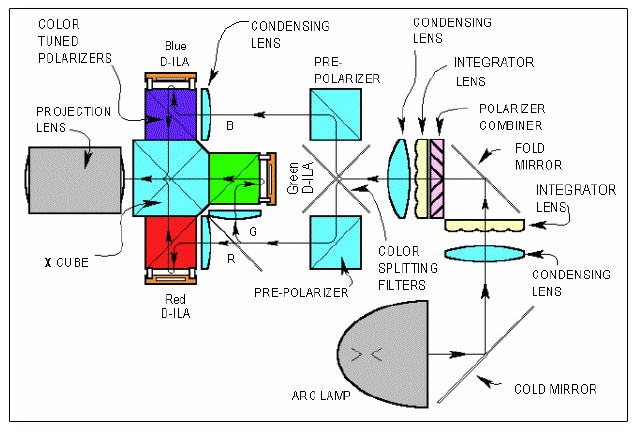 Between the DMD chips and the lens array is a wheel made up of coloured filter segments (red, green and blue in the simplest design). The colour wheel spins rapidly (50 times per second for a single speed wheel on a 50Hz supply) and the tilting of the mirrors is timed to allow light to either pass or not pass through each filter as the wheel rotates, producing a colour image. The result of this process is that DLP projectors build a colour image by displaying a series of static monochrome images. The rainbow effect - sometimes referred to as colour separation - occurs when the eye can detect these monochrome images in parts of the overall image produced. Most people are not susceptible to this problem but if you are then it can make single chip DLP projectors uncomfortable to watch. The problem has been somewhat alleviated recently with the development of faster colour wheels with more segments, causing the image to be refreshed more often each second. See Flicker Fusion Threshold in our glossary. LCD (Liquid Crystal on Silicon) is currently the most widely used projection technology in the world. Generally the systems used are made of 3 monochrome lcd panels, one each for red, green and blue. Light from the lamp passes through two dichroic mirrors, which separate the light into its primary colours. Each colour then shines on an lcd micro-screen, each pixel of which can either be "on", blocking light, or "off" allowing light through. The light that passes through enters a dichroic prism which re-combines the red, green and blue to produce a colour image which passes on to the projector lens. Until fairly recently people using LCD projectors have been able to see fixed pattern noise when viewing an image. This is the grid pattern made up of the gaps between individual pixels. As LCD technology has improved and resolutions have increased this artifact has become less and less of a problem. With high resolution lcd projectors it is reduced to the point where it can rarely - if at all - be seen from normal view distances. D-ILA (Direct-drive Image Light Amplifier) is a development of JVC and is sometimes referred to as LCOS (Liquid Crystal On Silicon). D-ILA operates on a reflective rather than transmittive principal. In other words, the polarised light (red, green and blue) is reflected by D-ILA chip's rather than be transmitted through the LCD chips. The D-ILA device's reflective technique involves laying out the pixel address selection section and the light modulation section liquid crystal in three dimensions. The entire surface, except for the insulation section between pixel electrodes, is used as a reflective surface, so a very high aperture ratio is possible (making D-ILA more efficient than other technologies). The primary benefit to consumers of D-ILA is the ability to produce high light output whilst retaining high contrast without relying on lens iris adjustment.